The 1960 World Final, Wembley, Sept 17, is remembered mostly for the triple run-off to decide the Medals. Ove Fundin had 14 points, beaten only by Ronnie Moore. As defending Champion, Moore also had 14 points, beaten only by Peter Craven. And after four straight wins, Craven went down to Fundin. After that race, Craven needed assistance as after hitting a pothole, had been badly hurt. The Gold Medal run-off saw Fundin hold off the amazing challenges of Moore to take his second World Title. "The tapes flew up and Ove, gating magnificently, rocketed into the first bend with me breathing down his neck and Peter inches behind. I know now that I could have won if I had not lost my cool on the first lap. I tried to go round Ove, he drifted wide and I ended up scraping the skin off my knuckles on the safety fence. That made me mad and I tried to force my way inside him down the back straight next time round. What a mistake. Ove is not the sort of person to be pushed around. He closed the gap with a thump, we collided and I bounced off. A pain shot up my arm. I thought my wrist was broken. I hung on grimly to the skidding bike and the moment passed. Ove had gained the margin he needed. I had no chance of catching him." And Craven was not far behind either. WOW !!! These three were ofcourse, the creme de la creme and rightly so, it was all about them. This story however uncovers what happened right behind them underneath the Twin Towers. Peter Moore from Australia, with 12 points was fourth, BEATEN ONLY BY THE TOP THREE! In the previous four World Finals, those 12 points would have put him on the podium. The two wins and three second places saw Peter's best World Final performance from 5 appearances. "Once, when Fundin staged a magnificent last bend dash around Peter Moore to win heat 14 by the skin of his Swedish teeth, I even found myself on my feet clapping the magnificence of it." Yes, Peter Moore held off Fundin for almost the entire 4 laps and was only beaten on the run to the flag, by a length ! GOOD HEAVENS !!! Peter would go on to take an FIM Bronze Medal, at the 1963 World Team Cup Final with the Great Britain team behind Sweden and Czechoslovakia. And ofcourse, Peter was the victorious manager of the Australian team that won the 1976 World Team Cup. Heat 3. R Moore, P MOORE, Zyto, McKinlay. Heat 7. Craven, P MOORE, Kaiser, Elliot ret. Heat 9. P MOORE, Hofmeister, Sormander, Taylor. Heat 14. Fundin, P MOORE, Johnston, Lawson. 5th was Kiwi Ron Johnston. Ten points was his best World Final in four appearances. He had been 12th in 55, 6th in 1957 and 8th in 1958. Johnston is ofcourse THE most overlooked Kiwi. When Geoff Mardon hardly gets a mention behind Ronnie Moore, Barry Briggs and Ivan Mauger, you can see how this works. On this night, he was very much in the master class. Heat 4. JOHNSTON, Sormander, Kwoczala, Elliot. Heat 5. McKinlay, JOHNSTON, Briggs. Taylor fall. Heat 12. Craven, JOHNSTON, Young, Zyto. Heat 19. R Moore, JOHNSTON, Hofmeister, Kaiser. "He represented his country in 16 Internationals and though largely out-dazzled by the Craven magic at club level, under Ron's captaincy the Aces won the Brittania Shield three times and the Daily Mail National Trophy. He remains one of the best New Zealanders to have graced the sport and one of the Manchester side's finest." In 7th place was 25 year old Polish Champion, Stefan Kwoczala. At the European Final, Wroclaw, Aug 14, he had scored 11 points and finished 3rd behind Marian Kaiser and Ove Fundin. In England, he was a member of the Leicester team and scored a massive 153 points that year. [ Ken McKinlay 221. Alf Hagon 91. Bryan Elliot 90. ] He was not going to be a threat to any favourites at Wembley but he surprised many with his hugely impressive top 8 finish. But not all, this guy could ride ! Sadly this was Stefan's one and only World Final appearance, injury ending his oh so promising career, so I'm told. Heat 6. Fundin, KWOCZALA, Zyto, Hofmeister. Heat 11. KWOCZALA, McKinlay, Lawson, Kaiser. Heat 13. Craven, R Moore, KWOCZALA, Taylor. Heat 20. P Moore, Briggs, KWOCZALA. Young fall. Then in 8th place was perhaps the biggest surprise in West Germany's Josef Hofmeister. It was his fourth straight World Final, previously scoring 0, 2 & 4. So his 6 points was a natural progression. Heat 2. Craven, Briggs, Lawson, HOFMEISTER. Heat 16. HOFMEISTER, Young, McKinlay, Elliot. Retiring a few years later, "Auf Weidersehen Pet", this was his last World Final appearance. HOWEVER, it was in the field of Longtrack racing that Josef was a true legend. 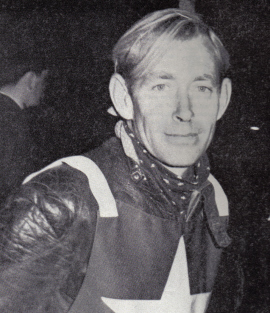 The first European Longtrack Final was held in 1957 where he was 2nd to Norway's giant Basse Hveem. Then came the first 'Triple Crown'. 1958, 59 and 60 all won by Josef Hofmeister ! There would be another 'Triple Crown', 1966, 67 & 68 by another West German, Manfred Poschenrieder. When in 1971 this event became the World Longtrack Final, no one was able to do the three in a row ! Ivan Mauger won 71 & 72. Failing to qualify for 73. Egon Muller won 74 & 75. Finishing 3rd in 76. Karl Maier won 87 & 88, third in 89. Then came Simon Wigg. He won 89 & 90. Ninth in 91. And later, Wiggy came the closest ever, winning again in 93 & 94, but lost the Gold Medal run-off to Kelvin Tatum in 95. The World Longtrack Final coming to an end in 1996. So this little history piece is to show how much of a Superstar, Josef Hofmeister really was. When you see the talent that filled the second half, you may see why I wanted to highlight the efforts of those who finished in the shadows of the top 3.